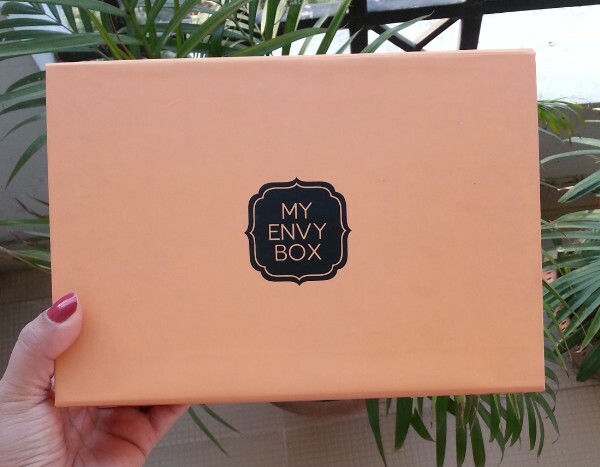 Hi everyone, today I am going to share My first experience with the Envy Box subscription – I subscribed for the envy box in mid of the month (Feb 2014) but did not receive even after 1 month of order due to some mis-communication between Envybox team and the courier company Javas . I called them to tell that I was not happy due to this delay . They apologized for the delay and guess what , they offered me 1 month free envy box ! I was not happy for the long wait for my first envy box but free 1 month envy box plus great products inside both the envy boxes received made me forget that unhappiness ! 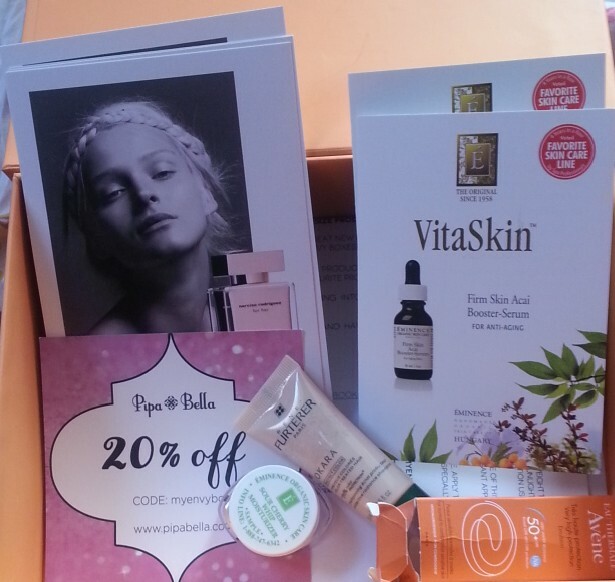 Ok now lets come to the products which I received in My Envy Box March edition. I got 5 samples from luxury brands like Rene Furterer, Narciso Rodriguez, Eminence Organics and Eau Thermale Avene. 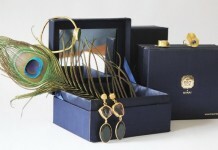 They also sent a 20% discount coupon on purchase of jewelry from pipabella.com. 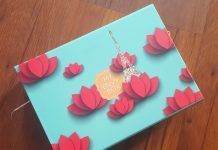 The packaging is same as the Feb My Envy Box, all samples were placed in a sturdy orange box. Products were further wrapped in a red cloth pouch. 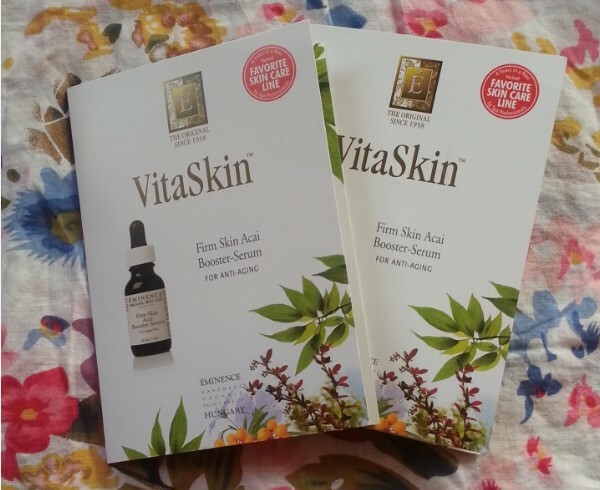 Eminence Organics Vita Skin Firm Acai Booster Serum : I got two samples (2ml each) of this serum. The product claims to hydrate, revitalize and rejuvenates skin. It is very effective in minimizing the appearance of fine lines and also improves skin elasticity. I am looking forward to use this serum. 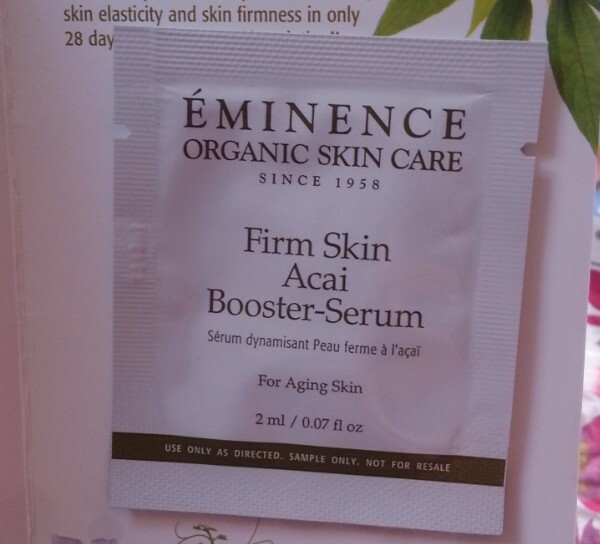 Eminence Organics Vita Skin Firm Acai Booster Serum Price in India is Rs.4,393 for 30ml. 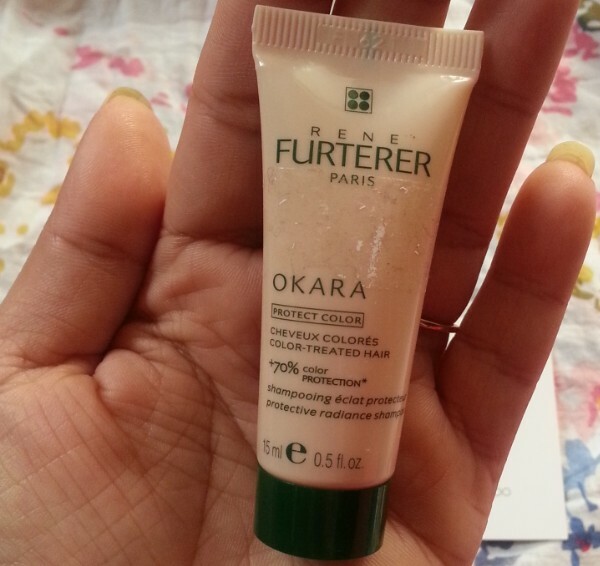 Rene Furterer Okara Protect Color Radiance Enhancing Shampoo : I got the 15ml sample of this shampoo that will last for only one wash. It claims to maintain color vibrancy while enhancing hair intensity and radiance. 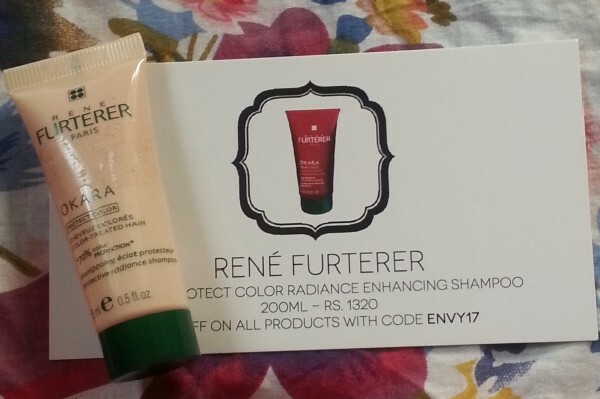 Rene Furterer Okara Protect Color Radiance Enhancing Shampoo Price in India is Rs.1320 for 200ml. Eminence organics Sour Cherry Whip Moisturizer : It is enriched with vitamin C and is highly effective in fighting signs of aging. I have used this moisturizer twice and it hydrates & moisturizes skin. It has a bit thick consistency and takes a minute to get absorbed by the skin and this sample will last for 4-5 usages. 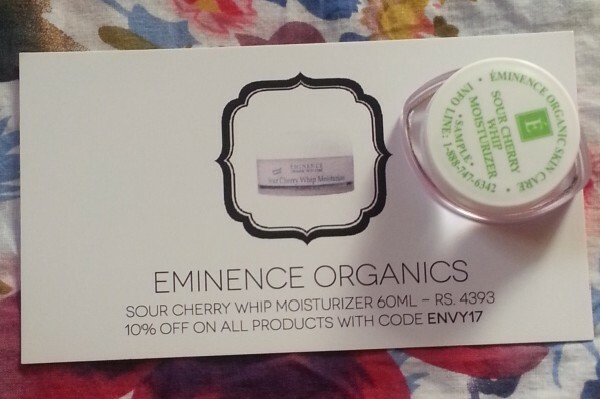 Eminence organics Sour Cherry Whip Moisturizer Price in India is Rs.4,393 for 60ml. 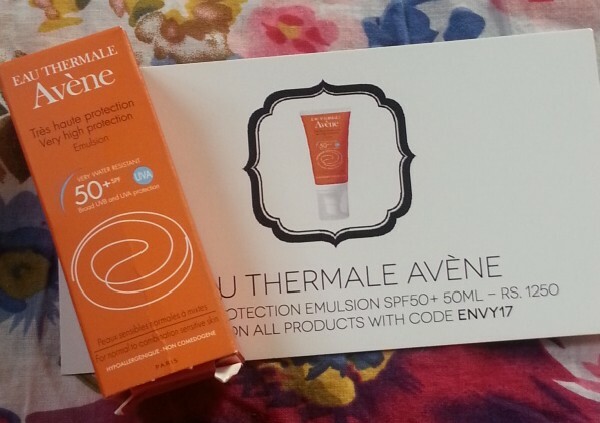 Avene Emulsion 50+ SPF (5ml) : Fourth product that I got is same as I received in my last month’s Envy Box i.e, . I have already used this sun screen and felt very happy when I received it again. 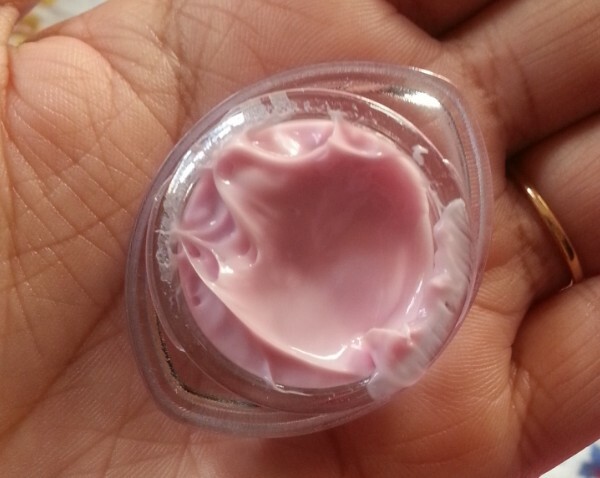 Its lightweight formula doesn’t make my skin oily or patchy. 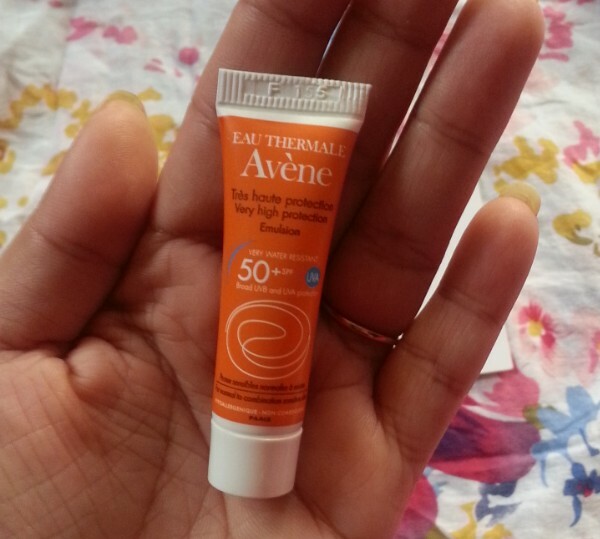 Avene Emulsion 50+ SPF price is Rs.1250 for 50ml. 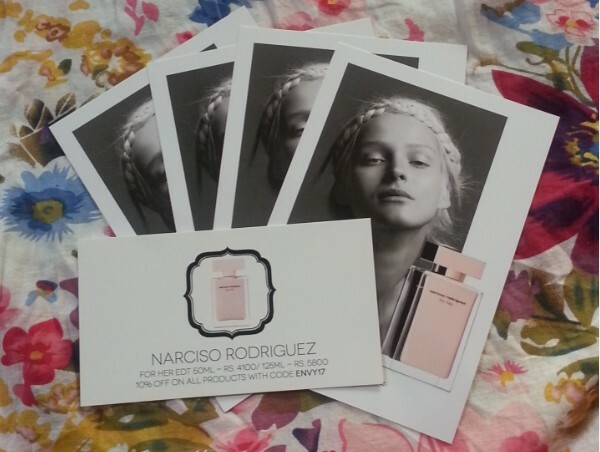 Narciso Rodriguez For Her EDT : Last but not the least I got 4 samples of Narciso Rodriguez perfume. It smells amazing and I have already used two samples and I am planning to buy the 125ml bottle after this samples are finished. I just loved it. Narciso Rodriguez For Her EDT Price in India is Rs.4100 for 50ml and Rs.5800 for 125ml. 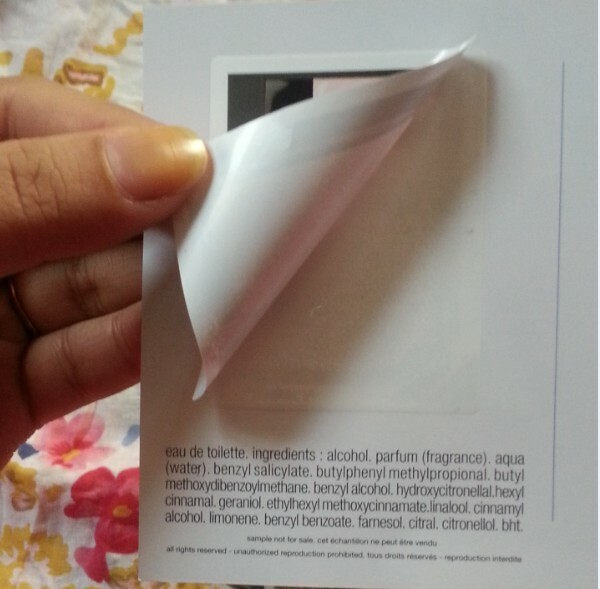 My Envy Box also contains Cards that contain information about each product including the price of full size product. 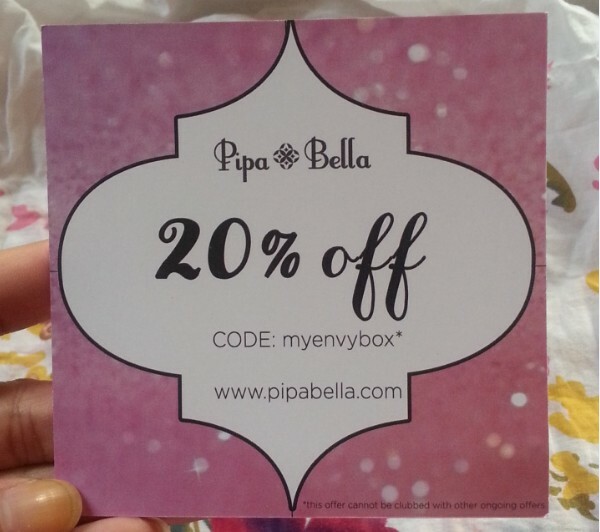 I also got 20% discount coupon from popular online jewelry shopping website pipabella.com.